Monarch Air Group provides private air charter in Asheville, NC. Our clients benefit from top-notch service, unrelenting dedication to safety, wide selection of aircraft, and years of experience in chartering private jets. To obtain a free quote, please use our online quoting tool provided below, or call toll free 1-877-281-3051. Monarch Air Group provides private jet charter flights in and out of Asheville, North Carolina. Settled in 1784, the City of Asheville is a beautiful mountain city surrounded by the picturesque natural beauty of Blue Ridge Mountains. 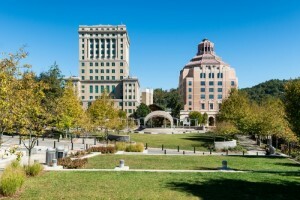 Asheville is North Carolina’s largest city with a population of 80,000 people in the main city and 220,000 people in its surrounding areas. There are many national and small business, shopping centers and wonderful museums, the best nighttime and dining activities. The Blue Ridge Mountains provides relaxing nights, calm days, and spectacular stars’ views.